I love to walk around team spaces and identify cool things that people are doing so I can share them with the organization. Last week while doing a Gemba Walk in one of my offices I found this! On his metal scrum board he created “What’s at Risk” information radiator magnets in the design of a traffic light. Red indicates that the story is at risk with a high likelihood that it will not be completed this sprint. Yellow indicates that the story is somewhat at risk and there is a chance that it will not be completed this sprint. Green indicates that story is not at risk and is expected to be completed this sprint. He uses two magnet discs to cover up the extra colors and only displays the current risk state of the story. This is a great, simple way to make risk transparent to the team so they can make appropriate decisions and adjustments as well as communicate properly to stakeholders. 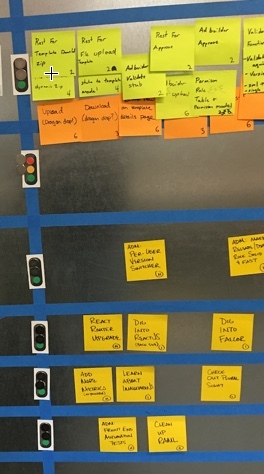 Placing the information radiators on the scrum board makes it very easy for anyone walking by to know exactly what to expect this sprint. It also gives indications that help may be needed to remove roadblocks or provide information in order to help the team move forward on that story. Information radiators are a great way to promote transparency. How are you using them to help your team grow and to allow others insight into how they are doing?